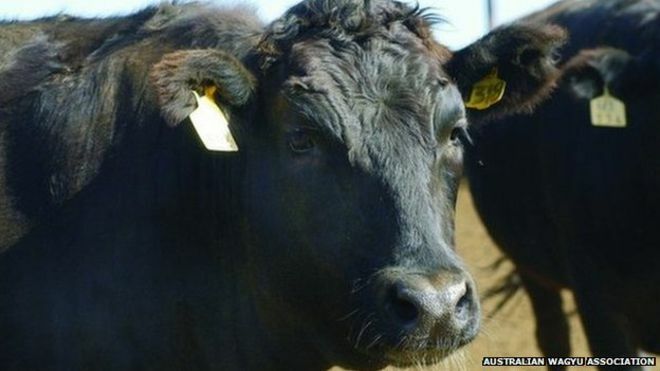 (P1) It’s the world’s most expensive beef, but Australia’s business competition WATCHDOG is currently investigating meat products that are labelled Wagyu. (P2) There’s been an OUTCRY, from consumers and producers alike, who are worried that a product PARADING ITSELF as Wagyu beef may not be THE REAL DEAL. Especially if it’s a burger going for less than about $5 (£3.20), the price attached to some fast-food Wagyu burgers being sold around South East Asia. (P3) About 10 years ago, for example, you may have been asked to pay as much as $130 (£85) for a Wagyu steak sandwich. (P4) A piece of buttery, sweet, and SUCCULENT Japanese full-blood Wagyu meat should most certainly cost much more than $5, say most farmers and restaurant owners. (P5) In fact, a juicy 200g steak in some of the world’s top restaurants can SET YOU BACK as much as $200 – or more. (P6) Its MELT-IN-YOUR-MOUTH TENDERNESS has been described by food AFICIONADOS, GOURMET grocers, master BUTCHERS and cattle BREEDERS as one of the most extraordinary meat products the world has to offer. (P7) So when burgers containing very little full-blood Wagyu meat are on the market, it’s a cause of concern for Wagyu cattle breeders, especially farmers in Japan, where the product is carefully protected and TRADEMARKED. (P8) It’s also a cause of concern in Australia – now a major exporter of the product. (P9) Wagyu cattle were originally DRAFT ANIMALS used for farming purposes in Japan because of their strength. (P10) Today in Japan, there are only four breeds that are considered Wagyu, and the product is sold according to where the animal was grown. (P11) Kobe beef for example – which is ARGUABLY the world’s most famous Wagyu meat – comes from Japan’s Hyogo PREFECTURE where Kobe is the capital. (P12) Wagyu beef outside of Japan can often include CROSSBRED meat. (P13) In Australia, there are five grade descriptions of Wagyu beef, ranging from full-blood, which should have no evidence of crossbreeding, to Wagyu F1, which should have at least 50% Wagyu genetic content. (P14) Australia’s crossbred Wagyu industry often involves a Japanese bloodline crossed with Angus and Braham breeds, among others. (P15) In October last year, the Australian Competition and Consumer Commission launched its investigation. (P16) The watchdog said it was concerned that products being labelled Wagyu were in fact from crossbred cattle, and that this “may have the potential to mislead consumers into thinking that the beef is from the (full-blood Japanese) Wagyu breed of cattle”. (P17) The Australian Wagyu Association, which represents both full-blood and crossbred Wagyu breeders, says it supports the investigation – and stresses its concern over “truth in labelling and product INTEGRITY“. (P18) But as some breeders continue to work towards creating a more honest marketplace, and the government’s national investigation continues, Wagyu meat is becoming more widely recognised – and retailers everywhere want A SLICE OF THE ACTION. (P19) In Singapore alone, COUNTLESS restaurants, cafes and even fast-food outlets offer Wagyu beef on their menu – and Wagyu burgers are the trend. (P20) Retailers selling good quality burgers are most likely to tell you straight away where their meat comes from and how they mix up their PATTIES, while others offering cheaper options are likely to avoid such questions. (P21) One of Singapore’s best-known STEAK HOUSES, The Prime Society, orders a lot of Wagyu from Australia, and promises if customers want to find out exactly where their meat is from, they can. (P22) “Sometimes I even leave the label on to show AUTHENTICITY,” says the restaurant’s chef Muhamad Zulkefle. (P23) A 200g piece of Australian full-blood Wagyu from a farm called Mayura Station at the Prime Society will cost close to 90 Singapore dollars ($62; £40). (P24) Meanwhile, Mos Burger, which is headquartered in Tokyo, offers Wagyu burgers through its Singapore stores for as little as $4.85 Singapore dollars ($3.50; £2.30). (P25) The firm has more than 25 stores in Singapore, and some 1,400 in Japan, but, the firm would not respond over the phone or to several written requests for information about its beef products. (P27) Mr de Bruin is credited with importing Australia’s first black-haired Wagyu cattle from Japan in 1998, and Mayura Station is regarded today as one of Australia’s top Wagyu breeders. (P28) He said very cheap Wagyu patties “could possibly have some Wagyu trim mixed with other products”, but was ADAMANT that such products should not be labelled “Wagyu”, and that crossbred products coming out of Australia should be clearly labelled. (P31)”In some places though, you wouldn’t HAVE A CLUE what will turn up on your plate when you order Wagyu. Do you enjoy high-quality beef, or do you prefer other meats or fishes? Or are you a VEGETARIAN? What is the most expensive restaurant meal you have ever eaten? Do you think that food labels are usually accurate?